The Minnesota Senate Judiciary Committee sent the bill forward with a 5-3 party line vote. 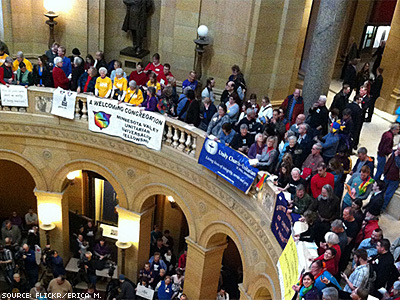 The Minnesota state senate judiciary committee advanced a marriage equality bill to the full senate with a 5-3 party line vote on Tuesday. The committee passed the bill after three hours of testimony, according to NNCNow.com. The house civil law committee will finish hearing testimony on the legislation Tuesday evening. Those submitting testimony include an 11-year-old girl who opposes marriage equality, and pastor David Wheeler, who has a gay nephew. According to Richard Carlborm, a campaign manager for Minnestoans United, there are less than 10 weeks for the legislature to pass a marriage equality bill. "Minnesotans want to see our shared values represented in our state law, and those values simply do not include excluding some people from having the freedom to marry and pursue happiness just because of who they are," he said. Governor Mark Dayton has said that he would sign a marriage equality bill if it reached his desk.